If you regularly spike, dunk, or high jump, you probably already work on your vertical. But did you know that improving your leaping ability could pay dividends even if your fitness efforts keep you firmly on the ground? How well you jump serves as a marker of strength and power—in other words, how quickly and explosively you can move. Those skills serve you well in any athletic endeavor, from running to weightlifting to shooting hoops. 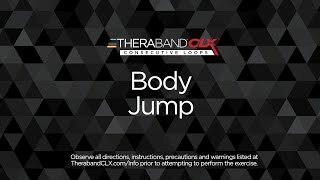 Thanks to the Thera-Band CLX, there’s a new way to train your vertical. The Body Jump exercise allows you to add resistance to the movement, building muscle more quickly—while still keeping your hands free to set, hit, rebound, or block. Add it to your routine, and you just might boost your height by leaps and bounds. Place your feet in the middle two Easy Grip Loops, separated by one seal. Hold the ends of the CLX in each hand, using either an open or closed grip. From the semi-squat position, jump upward while extending your arms against the CLX. Land softly with your knees in line with your hips and shoulders; don’t let your knees buckle inward.